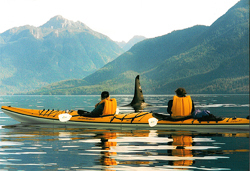 Sea kayak touring provides you with an intimate experience in the marine environment and is ideally suited to exploring the coastal areas of Vancouver Island, British Columbia. Our commitment to you is to consistently provide quality sea kayaking vacations and the very best in knowledgeable and personalized service. Located on Vancouver Island, British Columbia, Pacific Northwest Expeditions is the Canadian sea kayak touring outfitter which has created unique camping, and lodge-based sea kayaking trips for the discerning adventurer. Come share our passion for sea kayak touring, wildlife viewing and our beautiful Island home. 2013 will mark the 16th season for Pacific Northwest Expeditions in providing sea kayaking adventure trips here on Vancouver Island. Sea kayaking day trip in the Gulf Islands. This day trip provides a variety of sea kayak touring and wildlife viewing opportunities, all easily accesible from the Nanaimo area. 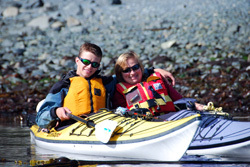 This trip is suitable for singles, couples and young families who would like to experience sea kayak touring here on Vancouver Island. Join us for your Sea Kayaking Day Trip. The temperate North Gulf Islands situated off the southeastern end of Vancouver Island, provide endless sea kayak touring opportunities. These Islands lie in the rain-shadow of Vancouver Island enjoying the mildest climate along coastal British Columbia. 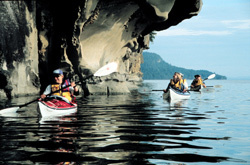 The Gulf Islands offer stunning scenery, an excellent choice for a 3-day sea kayaking adventure. When explored by sea kayak, the waterways of Vancouver Island, British Columbia, offer unsurpassed adventure and natural beauty! Gulf Islands Sea Kayak Trip. Explore by sea kayak the secluded western shores of Vancouver Island, British Columbia in the Broken Group Islands of Barkley Sound, or Clayoquot Sound. These wilderness camping sea kayak touring adventures will take you to places of sandy beaches, temperate rainforest and rugged islets off the west coast of Vancouver Island. Join professional naturalist/sea kayak guides for a sea kayaking adventure with killer whales in Johnstone Strait, British Columbia. This area is world renowned as the best location on the planet in which to observe wild Orca whales in their natural habitat. Experience the thrill of seeing killer whales from a sea kayak, and learn about the fascinating and complex aspects of their behavior, social organization and ecology. Sea kayaking in Johnstone Strait to see killer whales should be on your must do list! Both our Orca Classic and the Orca Humpback Discovery tours are truly unique in that they are classic sea kayak touring trips form start to finish and are not supported by motorized vessel transfers. 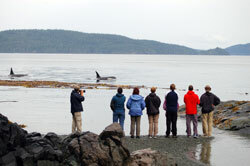 Our Orca Classic trip is a 4-day base camp sea kayaking tour with a focus on killer whale viewing. 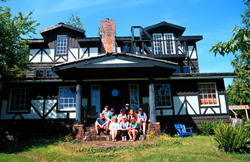 Our private base camp is located in the core travel area of the northern resident killer whales which maximizes our opportunities for an unique wilderness experience and opportunities to see orca whales in their natural environment. This is our ultimate wildlife and sea kayaking tour, spending 6-days in Johnstone Strait, Blackfish Sound and the Broughton Archipelago. Our Orca & Humpback Discovery adventures are for those who want to focus on seeing killer whales, humpback whales and other marine and terrestrial wildlife while still having the experience of a richly rewarding sea kayak touring adventure. We invite you to join us for a lifetime experience. 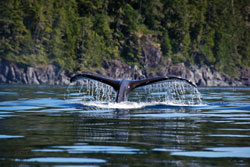 Pacific Northwest Expeditions offers British Columbia kayaking tours from Vancouver Island, BC Canada. 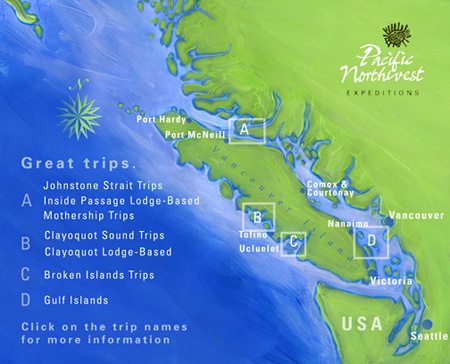 Now in our 16th year, Pacific Northwest Expeditions has helped set the standards for British Columbia kayaking touring vacations and sea kayaking holidays. Our multi-day sea kayaking trips are ideal for active singles, couples and families. 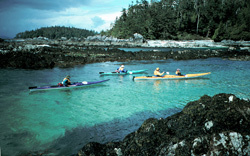 Sea kayaking holiday tours depart from Vancouver Island locations at Telegraph Cove, Tofino, Ucluelet, and Nanaimo. Join professional sea kayak guides for sea kayaking with killer whales, lodge based sea kayak vacation tours, and sea kayaking adventures. Discover Vancouver Island's best paddling and wildlife viewing destinations with Pacific Northwest Expeditions, perfecting the art of adventure kayaking! Reserve your sea kayak tour online.